Two British cave diving experts key in the operation to save the Mu Pa boys at Tham Luang were given a good send off at Suvarnabhumi airport last night. And they left with some good British humor that got the crowd laughing. "Yeh. Don't be naughty again!" While his compatriot John Volanthen chipped in with: "Don't go in caves when it's raining!" The mood was a happy one as tourism and sports minister Weerasak Kowsurat and communications minister Arkhom Termphitayaphaisit turned up with a host of other officials to say thanks on behalf of the Thai people. 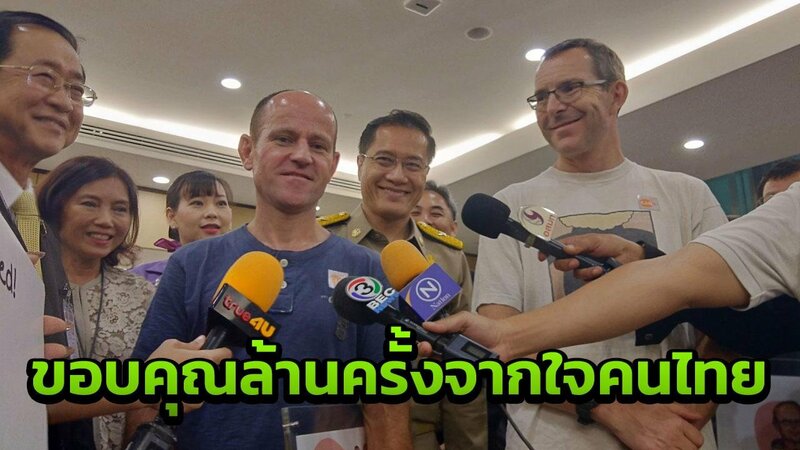 Mr Volanthan and Mr Mallinson - both members of the British Cave Rescue Council - praised the Thais and the international effort before heading to London on TG 910 just after midnight. Well done lads, excellent result, pity the overpaid prima donnas could not do the same in the World cup. Brilliant. These guys are awesome, totally down to earth and obviously blessed with a sense of humour too. Safe Flight home fellas, and thank you for coming. Typical and what I expected . No fuss no drama pack there gear a few words and off they go . Job well done . Respect you guys !! Till the next time . And while it wouldn't have made a difference to them answering the call I'd like to think Thai powers that be rewarded them monetary for there efforts !! Nice to see such modesty, in such brave people. Total professionals, arrive, do their work and depart with a gracious smile and a joke. While I hope my son doesn't grow up wanting to be a cave rescuer, they are in all other respects, the perfect role model. Big thanks ! Well done ! Job over! Pack and go! No overstaying! You can hear some of the interview in English with John Volanthen here @ 8.34 where he's asked by a Thai female reporter, "What do you want to say to the kids?" and he quips back: "Don't go into caves when it's raining!" Really impressed by the effort put in by many people around the world. I doubt if money would be accepted by the brave divers. However, a donation by the Thai powers to the British Cave Rescue Council ( and other bodies from other Countries ) would be a warm and generous gesture of thanks. A donation of this kind would enable these brave men to continue doing what they do , as most of the organisations are donation funded. This would mean more to these guys i,m sure. They need to cancel their work permit before they leave! I realize this is your attempt at humor, but I thought they were here as guests of the king.